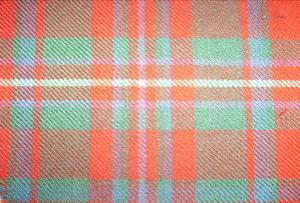 There are over twenty thousand different tartans registered with the International Tartan Index, which is the only record being kept of those both well established and new. Astonishingly Scotland has at this time no official register, and the fore mentioned Authority is working towards the creation of such a legal entity. 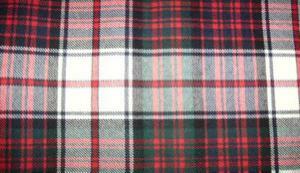 Now with such a vast number of different tartans available you would not expect to see them all listed on this page (at least I hope you wouldn't). So what I've done is to take a random few and photographed them for you, just to give you some idea of the variation of colours and patterns available. One very important point that I feel I must stress is that these photos are only to give you an idea of how these different tartans look. One problem with computers is that the colours can be distorted slightly by your monitor, and therefor may look a bit different from the real thing, so please do bear that in mind if you are looking to choose one online. 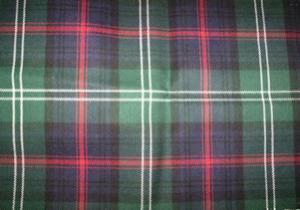 The first that I have to show you is the Mackinnon clan tartan, which is very appropriate for any formal occasion. The clan MacKinnon is one of Scotland's oldest clans, and more information can be found by following the link to that page. 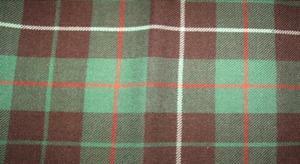 The next is the Mackinnon hunting, and this is used for the purpose that the name suggests, hunting on the moors. 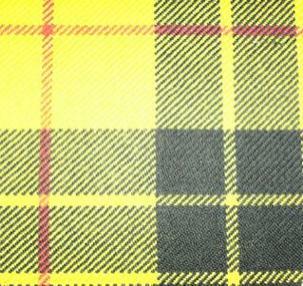 And as you can see from the colours you would be well camouflaged while wearing such a kilt while hunting. 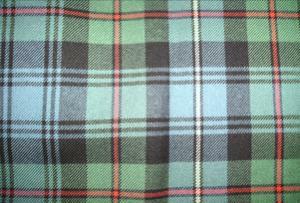 Next is the Macdonald Dress, this is the modern dress tartan belonging to that clan, and as you can see the colours are bright due to modern alkaline dyes being used in the manufacture of the cloth. And here we have the Campbell Ancient, and once again as the name suggests the dyes used are to resemble the vegetable dyes that were available centuries ago giving it a slightly faded look. The Robertson shown here is once again the hunting version from that clans collection, and as I explained earlier would normally be used for that purpose. But let me qualify that statement by saying that I have often seen hunting tartans being worn other than for hunting, and as I've said before the choice should always be yours. The Maclean modern is also a bright and vibrant one which would look very elegant at any formal occasion, and when dressed down would be equally at home in a casual setting. This Sutherland Old which is the alternative name for ancient, is one which is very close to my heart. The reason for this is that Sutherland was my mother's maiden name, and also happens to be my middle name, and it was the one that I very nearly chose for my own kilt. Finally though I decided to choose the Duncan not because its my surname, but rather I preferred it. 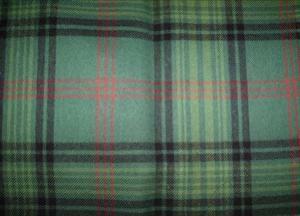 Clan Ross are one of Scotland's bigger clans, and here we have their hunting tartan, which as you can once again see would blend in very well on a Scottish moor. For anyone who has never been on a Scottish moor, they are indeed very green and lush (could it be something to do with the Scottish climate?). What can I say about the Royal Stewart, well it is without doubt the most popular when it comes to renting a kilt for a wedding or indeed any other occasion. Why is it so popular? well that's hard to say, but my own personal opinion is that it is so very attractive and predominantly red. When it is teamed with a black Prince Charlie jacket, the contrasting colours look stunning and I dare anyone not to look good wearing such an outfit. This one the Macleod modern also stands out among some of the darker or more muted ones, and again is very suitable for all dress occasions. This particular one is the Macleod of Lewis, and again there is a family connection as one of my favourite cousins is married to a Macleod (her maiden name was also Duncan) and she is fiercely proud of her Scottish heritage. The last one to be featured is the Gordon Ancient, once more a slightly faded look here in keeping with the older methods of dyeing cloth. I would just like to say that I didn't choose these particular ones for any specific reason, other than trying to give you a cross section of the vast choice of different tartans available. And with more being developed every year I'm sure that if you are looking for a kilt there is a tartan that you will love, and if not then why not design one for yourself? 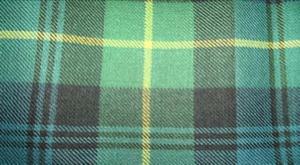 If you have any questions about a particular tartan or anything else connected with kilts or their accessories, please get in touch using the "contact us" page on the navigation bar, I would love to hear from you.